Could Trump Kaepernick and the NFL teach us all something about leading in our own individual, collective and sometimes divisive lives? I think so. 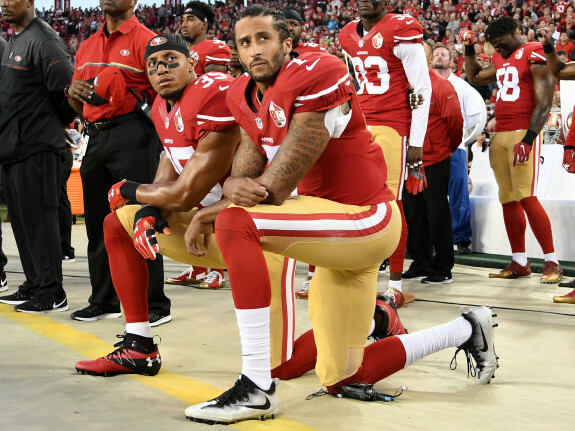 If you haven’t been following the National Football League, a controversy began over a year ago when San Francisco 49ers quarterback Colin Kaepernick chose to sit during the national anthem. (If you have been following, you might skip to the paragraph that begins, “Similar divides mark…”) Kaepernick chose not to stand to protest what he considered disparate racial treatment in America, epitomized by the numerous police killings of African American men and African American boys. He was sitting down in solidarity with those who didn’t feel like they were fully included in the American dream. * Other players have followed suit. Many decry Kaepernick’s actions. They feel he insults the American flag and the national anthem, two of our most precious symbols of American patriotism. In addition, they and others see Kaepernick’s actions as creating a greater rift of division in a country already split. The story got more complicated this year with two additional events. Kaepernick was released by the 49ers and no other team has elected to pick him up. It’s fairly widely believed that he is at least an excellent backup quarterback and potentially could return to his remarkable form when he lead the 49ers to the Super Bowl in 2012 and nearly again in 2013. Most on every side of this discussion would say that it’s not his football talent but his controversial quality that has caused NFL owners to avoid bringing him into their city and their stadium. This has spurred more players to take a knee in solidarity with Kaepernick. They are suggesting that whether you agree with him or not, he should be allowed to speak, and that blackballing him is a non-American action. Enter President Trump. In his inimitable way, he has suggested that NFL owners should tell players who fail to give respect to these American symbols and unity: “You’re fired!” His comments in speeches and tweets drove a deeper wedge deeper into the Great Divide. Over the weekend many more players took a knee, in opposition to what they viewed as the president’s support of racism and-or his repressive views toward the protections of free speech. The Steelers team remained in the locker room during the Anthem. Others, like Tom Brady, interlocked their arms with African American players to express solidarity. Player protests spread to the college ranks and Major League Baseball. Many other players put their hands over their hearts in the traditional symbol. Trump’s base cheered his tough stance. Many on “both sides” feel pain. Many ambivalence. Many anger. 1. See. That in times of insecurity and division our minds are psycho-socially engineered to become more tribal. Under stress and threat, we retreat into (and attack from) the tribes that will protect us – “my girls,” “my boys,” “the moral majority,” “progressives,” “homies,” “feminists,” “patriots.” You know who your “peeps” are. Of course, the irony is that we create a vicious downwards cycle: insecurity breeds tribalism, tribalism breeds greater insecurity as we become threats to each other. So, notice this tendency in yourself! 2. Listen to “them.” Not to fashion your next winning reply! Not to show they’re dumb, immoral, and screwed up. Not to go back and tell your tribe, “You won’t believe what this idiot said to me…” Kaepernick has something to say. Listen. So do those who want football to just be football. Listen. And so do those who feel there is a real place for us to stand shoulder-to-shoulder as Americans. Listen. 3. Build on reciprocal wisdom. If we listen, we can build “more perfect unions.” That’s hard. It’s easier to retreat to your tribe who will tell you how right you are. Fox and MSNBC, for example, can give you all the tribal righteousness you need in these deeply unsettling times. But we need listeners to listen across the divides. We need to water the soil that is dried and cracked. The flag and the national anthem are profoundly idealistic notions. Can we (on the left) not admire those who hold their hands over their hearts, not smugly, but because they really do believe in this amazing aspirational country. And can we (on the right) not admire those who sit or take a knee? Taking a knee is a profound gesture; Catholics call it genuflecting, humbling themselves before a crucified-risen God. Football players collectively take a knee when a player from either team has been hurt and is being attended to by doctors. It’s a way of going beyond the game, beyond my team or my needs, to a deeper level of connection.